When you adopt a working cat from us, you are giving it a job AND you are saving the life of a homeless animal who otherwise would not have been suitable for adoption! We believe Every Animal Should Enjoy Life. Our Working Cats Program does just that. It enables us to provide these unique cats an ideal environment in which to thrive – and it saves lives! 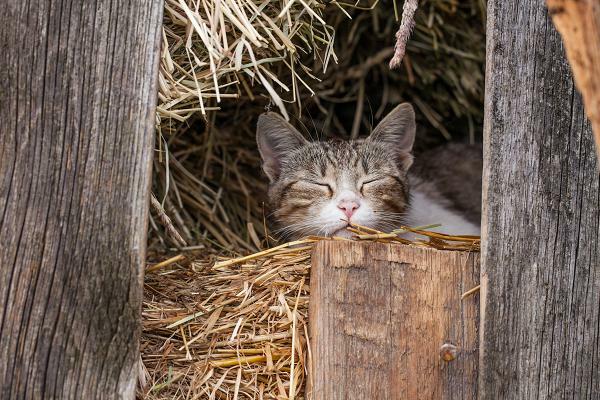 Commonly known as a “barn cat,” a working cat is usually quite independent. Often their behaviors are not suited for a traditional home. They may lack socialization, prefer little to no human contact, were former “outdoor” cats, or have high energy levels. Or, they may have found their way to us as part of EASEL Animal Rescue’s TNR (trap-neuter-return) program that reduces feral cat colonies in the greater Mercer-Bucks County region. Working cats offer an environmentally-safe alternative to poisonous pest controls. While most are natural hunters, we cannot guarantee they are good hunters that will actually catch rodents. But we do know they are pretty good at making a difference in rodent control in most adoptions. All working cats that are adopted from EASEL Animal Rescue League are spayed/neutered, and vaccinated. All they ask for in return is shelter, food, water and care. Thank you for helping a barn cat happily live out its life!